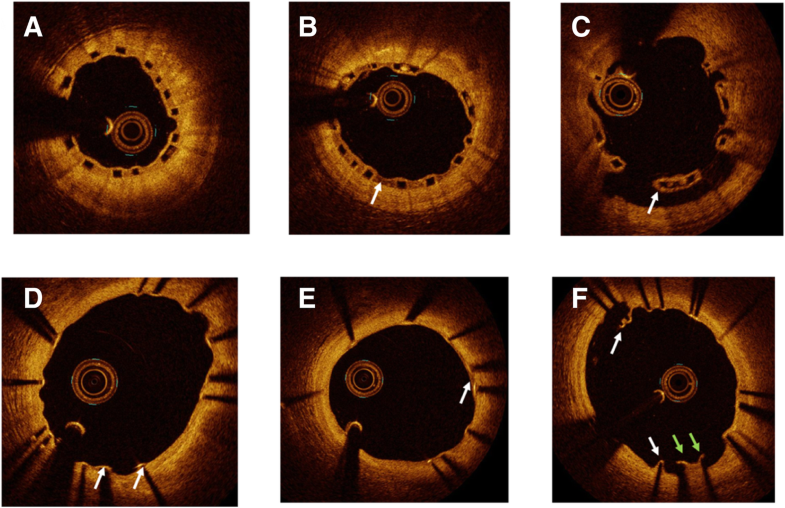 Incomplete re-endothelialisation following stent implantation is strongly associated with stent thrombosis. Optical coherence tomography imaging (OCT) revealed an increased frequency of uncovered and/or malapposed stent struts, residual thrombus, and late pathological remodelling in lesions of ST segment elevation myocardial infarction (STEMI) compared with stable coronary artery disease patients at mid-term and long-term follow-up [1–3]. To date, only one OFDI study reported the arterial response in a head-to-head comparison between Absorb and everolimus-eluting stent (EES), in stable coronary artery disease . One year after implantation, the neointimal thickness and percentage in-device area obstruction were comparable between groups. On the other hand, the vascular response after Absorb BVS implantation seems similar to that observed with Xience EES at 6 months in this particular setting of STEMI  but data concerning early re-endothelialisation remain scarce. The Synergy EES, which is now widely used, is made with biodegradable PLGA polymer, a platinum chromium scaffold, and thinner struts than the Xience and showed a particularly rapid endothelialisation in non-randomised preclinical studies . 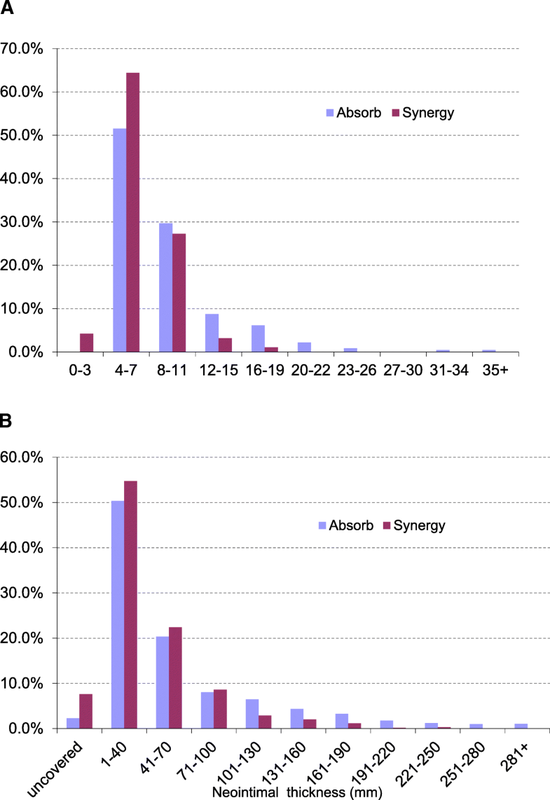 The purpose of this randomised, controlled, prospective pilot study was to compare the neointimal response of the Synergy EES and the Absorb BVS by OCT at 3 months after acute myocardial infarction (AMI). The primary endpoint was the 3-month neointimal response assessed as the percentage of uncovered and/or malapposed struts, neointimal thickness, in-stent/scaffold area obstruction, and pattern of neointima [7–9]. For the coronary optical frequency domain imaging (OFDI) endpoint analysis, the stent area and derived measures were based on the abluminal stent contour [10, 11]. The main secondary clinical endpoints included device-oriented composite endpoint (DOCE; composite of cardiac death, target vessel myocardial infarction (MI), and clinically driven target lesion revascularisation (TLR)) at 3 and 12 months; the individual components of DOCE; device and procedural success, all-cause death; any myocardial infarction; non-clinically driven TLR; clinically indicated and non-clinically driven target vessel revascularisation; and stent thrombosis, as defined by the Academic Research Consortium . Reinfarction is defined according to the Third Universal Definition of MI as evidence of myocardial necrosis in a clinical setting consistent with acute MI . Device success was defined as the implantation of the assigned study device with post-procedure residual stenosis < 30%. Procedure success was defined as device success without the occurrence of any component of the DOCE. Clinical follow-up was scheduled at 3 and 12 months. Angiographic follow-up was scheduled at 3 months.